I hope it is not too late to wish all my readers a Happy Ramadhan! It's been a while since I last cooked so it's taking a while to get comfortable back in the kitchen coz it does scare me a lil and quite honestly it's as good as starting all over again! I made scramble eggs a few days ago for breakfast and I'm more than thrilled it turned out well, lol so for now my mom is still the main chef here. But today, as of the day 6 of Ramadhan, my mom and I decided to cook a Kelatanese cuisine which is 'Nasi Tumpang' for Iftar. 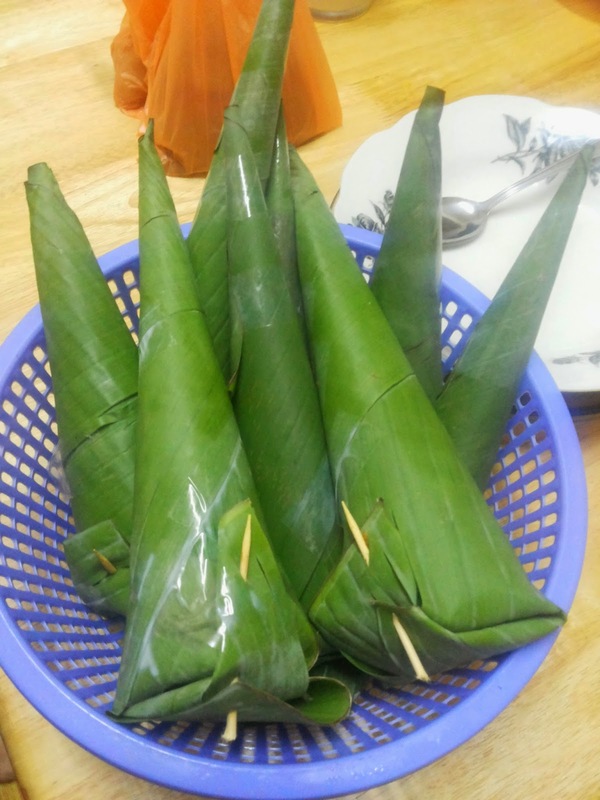 Nasi Tumpang is a Kelantanese secret recipe beautifully prepared layer by layer of pressed rice cakes and wrapped into a banana leaf shaped cone. The cost for ingredients cost a little less I believe and served 4 1/2 of us (Husband, mom, my lil sister, myself and Aulia') so huge thumbs up for cost saving factor while putting out a yummy easy to make dinner for on the table without buying at the Bazaar. Prepare about 7 to 8 banana leaf cones. Cut them into six-inch squares, roll each into a cone, and fasten at the seam with a bamboo skewer. Boil the rice to 'overcooked'. 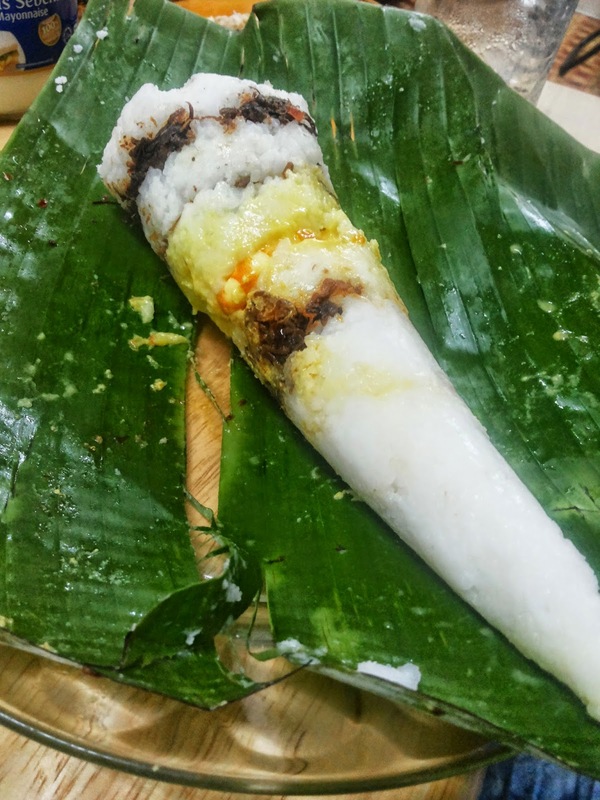 Make sure it became a lil bit soft so that you can compressed it easily inside the banana leaf cone. 1) Wash all the shrimps. You do not need to remove the shell, just cut the head. 2) Peel and finely dice 2 onions, then 4 tomatoes. 3) Start frying. Put a large non-stick frying pan over a medium heat. Add 3 tablespoon of cooking oil. Fry for about 30 seconds, stirring continually. 4) Now add 2 tablespoon of ginger and garlic paste. Stir well for a couple of minutes. 5) Add the spices : 1/2 teaspoon of turmeric, 1 teaspoon of red chilli powder. Fry for 5 minutes over a low heat, stirring frequently. 6) Add a cup of water and keep stirring until the water is absorbed. Turn the heat down, put the lid on, and leave to simmer for 10-15 minutes, or until the oil separates from the dish and rises to the top. 7) Turn the heat back up to high and add the prawns to the pan. Then stir in 2 generous pinches of salt. 8) Add approximately 200 ml of warm water to the pan. Stir. Then put the lid on and bring the heat down. Leave for about 10 minutes or until the prawns are cooked. Check occasionally. The prawns are done when they turn pink and opaque. When they are ready, turn the heat off. 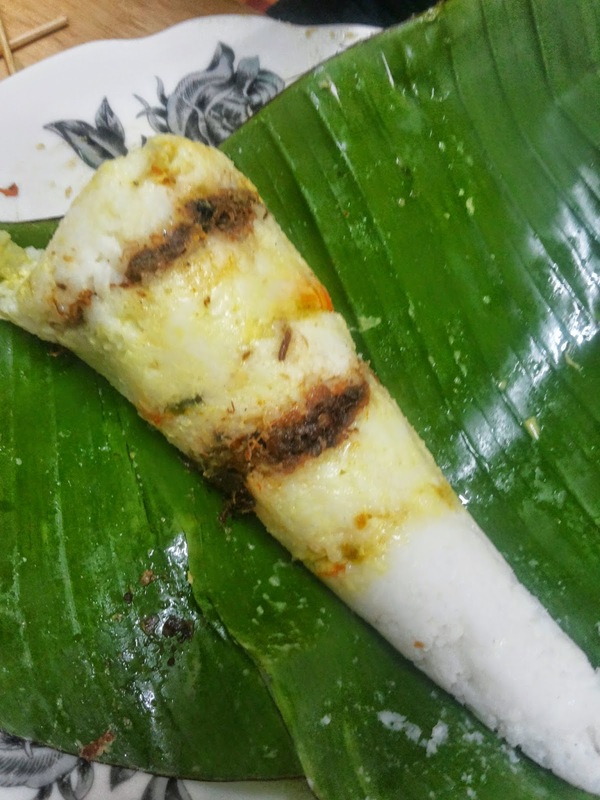 So now that all your main ingredients are ready, we can start filling the banana leaf cone with the soft rice, meat floss and shrimp. Each layers are stacked tightly and eventually the gravy from the shrimp curry will flow through the banana cones while the rice kernels still firm and stayed in shaped. I'm so gonna try this again peeps!